The Patriots were 15-0 headed to the Meadowlands and were looking to make history. The 10-5 Giants, who had already clinched a postseason birth the week before, were the only one’s standing in the way of the Patriots’ perfect season. The Gmen would battle the Pats (having no starters rest), but would fall short and lose 38-35. Even though it was a heart-breaking loss, the Giants learned that they could compete with the best in the league. This is the game that gave the Giants significant momentum heading into the postseason. After coming close to defeating the 16-0 Patriots, the Giants manhandled the Bucs in Tampa. Bucs’ cornerback Ronde Barber criticized Eli Manning’s toughness before the game, but it was Eli who had the last laugh. Eli threw for two touchdowns and 185 yards as the Giants defeated Tampa Bay 24-14. Off to Dallas. During the regular season, the Cowboys outplayed the Giants and won both games. But this marked the first time these two rivals ever met in the playoffs and the Giants were ready to make new history. Even though Dallas and runningback Marion Barber outplayed the Giants in the first half, the GMen found a way to come back and tie the score by halftime. In the second half, the Big Blue defense stepped up and held Dallas to only three points. After a Brandon Jacobs touchdown run, the Giants took the lead. With one more shot to win, Tony Romo lead Dallas down the field in the final seconds. But on fourth down, Romo was intercepted by R.W. McQuarters in the end zone. The Giants were headed to Lambeau. In one of the coldest games recorded in NFL history, the Giants were set to face the heavily favored Green Bay Packers. The Giants came out to a 6-0 lead with two Lawrence Tynes field goals, but the Packers went up 7-6 after a Brett Favre 90 yard touchdown pass to Donald Driver. Throughout the game, there would be four lead changes. But near the end of the fourth quarter, Lawrence Tynes had a chance to put the Giants on top. Unfortunately, the kick was wide right. However, the Giants were able to get the ball back and drive once more before the end of the fourth quarter. With three seconds remaining, out came Tynes once again. But the kick wasn’t even close as he shanked it wide left. The game headed to overtime with the Packers winning the coin toss and choosing to receive. But during the drive, Favre threw a pick (his last pass as a Packer) to defensive back Corey Webster on his own forty yard line. The Giants offensive was able to drive the ball within Tynes’ field goal range. Out came Tynes for his third attempt. Finally, Tynes came through to send the Giants to the Super Bowl. With three straight playoff victories, the Giants (aka “Road Warriors” given they had won ten straight games on the road) headed to Glendale, Arizona for Super Bowl XLII. Their opponent: the 17-0 New England Patriots. Ironically, there little scoring in the first half. This was crucial for the Giants, given that the Patriots had the most prolific offense in NFL history. The Giants defensive line significantly outplayed the Patriots O-line. Throughout the game, the Giants sacked Brady five times with a forced fumble. At halftime, the Patriots lead 7-3. But early in the fourth quarter Eli Manning found wide receiver David Tyree in the endzone for a touchdown to take a 10-7 lead. The Patriots offense finally put together an impressive drive with just five minutes left in the game. After a six yard touchdown pass to Randy Moss, Brady and the Pats took a 14-10 lead with just 2:40 left to go. It was up to Eli and the Giants to put together one final drive to win it all. In the first couple of plays, Manning was able to find Steve Smith for a first down and Jacobs executed a 4th and 1 rush near the Giants’ own 40 yard line. On the next third down, the play happened. Manning went back in the pocket and all hell broke lose. Two Patriots linemen were able to get a hold of Manning, but Eli somehow found a way to get out of the pile. He proceeded to drop back and chuck the ball down the middle of the field to Tyree. Tyree jumped in the air and held on. Patriots’ safety Rodney Harrison did everything in his best ability to disrupt the pass, but he failed. Tyree held on by using the top of his helmet to hold on as he was tackled. This was later voted as the greatest play in NFL history, but the drive was not over. After another Steve Smith first down, the Giants were in the red zone – 40 seconds remaining. 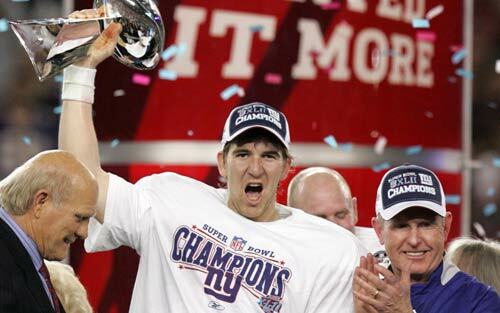 The next play was the greatest moment in my sports history: Manning’s touchdown pass to Plaxico Burress. I can still remember it now – the moment I realized Burress was going to catch the winning touchdown. At the beginning of the play, Patriots cornerback Ellis Hobbs (who was guarding Burress) tripped and Burress was left alone in the endzone. Eli immediately saw Plaxico and threw a perfect pass in the back of the endzone: 17-14 Giants, 30 seconds to go and one final chance for Brady to make history. But the Giants’ defense made sure Brady wouldn’t get a chance. After a crucial sack by Jay Alford, the Patriots were left with one final play. On fourth down, Brady threw a bomb to Moss but was easily deflected. The Giants were Super Bowl champions. This entry was posted on May 10, 2011 at 3:55 pm and is filed under 5BS Greatest Sports Moments (since 1990), Giants. You can follow any responses to this entry through the RSS 2.0 feed. You can leave a response, or trackback from your own site. it never gets old! made my day.